History is how we got here according to broadcaster Dan Snow who is on the road with his theatre tour An Evening With The History Guy. 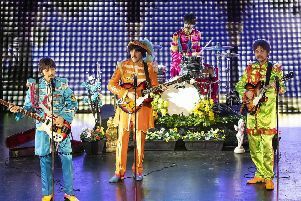 The show takes in Eastbourne’s Devonshire Park Theatre on March 25. Dan will offer tales of memorable moments from his career, but as he crosses the country, he will also reveal historical facts and stories relating to the specific place he is appearing in. Dan is in a happy position, sitting between acadaemia and the public, and able to travel between the two...thanks to a job offer from the BBC. He was then just about to launch into his postgraduate studies, but Dan hasn’t looked back. Times have changed excitingly: “People used to ask me what is the point of history. They don’t ask me that anymore. The difference has been the crash of 2008, the impact of 9/11 and other global events which have helped people realise that if we want to understand what is going on now, we need to understand what has gone before. If you want to understand war in Syria, if you want to understand the Israeli/Palestinian conflict, you need to delve into history. History is the essential reference point for the present. Dan cites the Brexit slogan “Take back control.” The slogan implies that we had control in the past. Dan also cites the Trump slogan “Make American great again.” The slogan implies that America was once great. Part also of the point of history is that we do learn from it. When Dan left Oxford, he started presenting history programmes with his father and their series Battlefield Britain went on to win a BAFTA. Over the years he has presented shows such as Armada, Grand Canyon and Vikings. Dan also hosts his own podcast History Hit and is part of the BBC Events team presenting anniversary programmes commemorating the Battle of Britain and the landings at Gallipoli. He has written or contributed to several books including The Battle of Waterloo Experience. “I love history. It’s everywhere. It’s everything that ever happened to anyone who has ever lived on this planet. It also means that I’m never bored on a train journey. As you travel, you see names that echo from the past. Every place has a history – wasn’t there a siege in the Civil War there?